W.M. 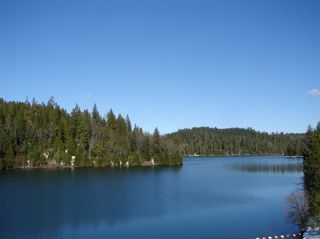 Beaty & Associates to log high on the Sierra crest in the Lassen area. 2-13-044-SHA (Huckleberry THP) W.M. Beaty & Associates, 1893 acres; 97% group selection, 3% no-harvest logging. Dry Burney Creek, Huckleberry (MD: T33N R2E Sec.14, 15, 22, 23, 24, 25, 26, 27, 35, 36). Winter operations, moderate erosion hazard, slopes up to 50%, 2 CA spotted owls within 1.3mi, fisher sighting, 3 goshawks within 1.3 mi, cascade frog sightings within 1.5 mi, coopers hawk nest, scattered large trees. Estimated public comment deadline: 09/28/13. 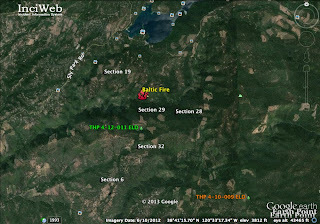 This THP is about 12 miles SW of Burney, CA, at a fairly high elevation of 4,730 to 5,870 feet near the Sierra crest. W.M. Beaty & Associates is planning a tractor based logging operation in mixed conifer stands consisting of ponderosa pine, sugar pine, lodgepole pine, incense cedar, Douglas fir and white fir. There are 14 road drainage work sites including rocking, dip construction and culvert maintenance, and a landing is proposed for use adjacent to a wet area. There were several wildlife sightings in the THP area including; a Cooper's hawk nest found in section 25 in 2013, a pacific fisher sighting in section 27, three goshawk nest sites in section 26, and a CA spotted owl nesting pair that fledged young in 2010 and 2013 in section 25. More information is available on the THP Tracking Center website. Simorg West Forests planning clearcut THP near Sugar Pine Reservoir in Placer County. THP 2-13-043 PLA (Cottage Home THP) Simorg West Forests, 315 acres; 100% clearcut logging, Huges Mill, Grizzly Flat (MD: T14N R10E Sec.1, 12; T14N R11E Sec.5, 6, 7; T15N R10E Sec.36; T15N R11E Sec.31). Winter operations, moderate erosion hazard, slopes up to 50%, 2 oversized units, herbicides, 4 CA spotted owls within 1.3mi, trees up to 36" dbh. Estimated public comment deadline: 09/27/13. This THP is about 4 miles NE of the town of Foresthill, CA and a few miles south of the popular Sugar Pine Reservoir recreation area. Simorg West Forests (formerly New Forestry LLC), is planning a tractor logging clearcut operation in second growth mixed conifer forest at an elevation of 3,400 to 4,100 feet. 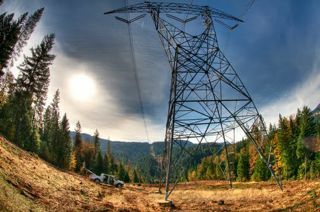 The THP area is located between the North Fork and Middle Fork of the American River, and close to the North Fork of Shirttail Canyon, a popular hiking and recreational area. Simorg West Forests is planning to use a skid trail in a class II watercourse in Unit 11, and Units 10 and 12 are oversized. More information is available on the THP Tracking Center website. Campbell Timberlands to log on steep and unstable slopes near the Middle Fork of the 10 Mile River. THP 1-13-068 MEN (Mosquito White THP) Campbell Timberlands, 191 acres; 70% transition, 30% selection logging. Booth Gulch, Upper Middle Fork Ten Mile River (MD: T19N R16W Sec.1, 2). Wet weather operations, moderate erosion hazard, steep slopes up to 85%, landslide terrain, road failure sites, flood plane, 16 road drainage work sites, impaired 303.d watershed, herbicides, coho watershed, 6 spotted owls within 1.3mi, marbled murrelet and osprey near haul road, scattered large trees. Estimated public comment deadline: 09/25/13. 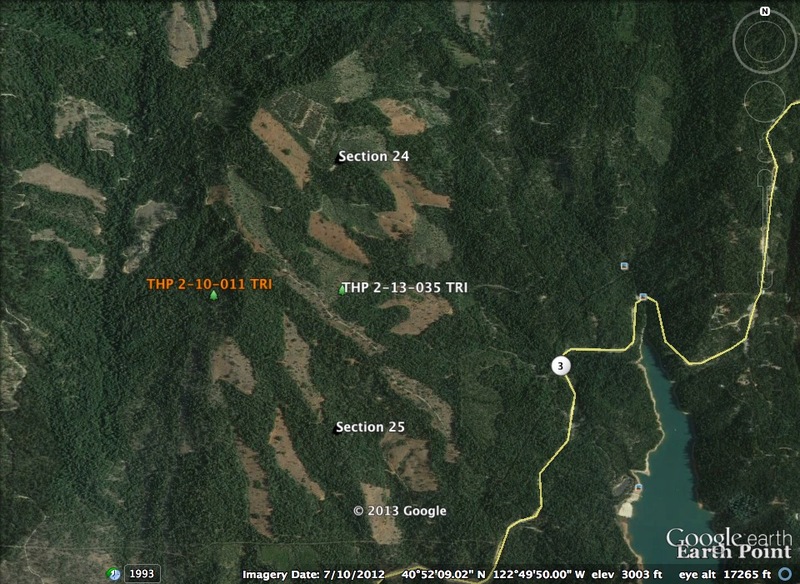 This THP is about a dozen miles NE of Fort Bragg, CA at an elevation of 320 to 1120 feet, near the Middle Fork of the 10 Mile River which is listed as impaired for sediment and temperature. Campbell Timberlands is planning a tractor and cable logging operation on steep and unstable slopes in second growth redwood, Douglas fir, grand fir and western hemlock forest. There are 37 shallow landslides within and around the THP area including debris slides, debris flows, channel bank failures and road fill failures. 16 road drainage work sites are planned including rocking, dip maintenance, ditch cleaning and road bed stabilization. Tractors are planned for use on landslide terrain in units B, C & D, within a watercourse in Unit B for yarding, and on steep slopes over 65% in unit D. There is a 100 foot long by 100 foot wide alluvial flood plane at the base of unit D, and several segments of roads are planned for use inside Class I and Class II watercourses. Marbled Murrelet habitat and an osprey nest is located near a haul road, and this THP will remove 15 acres of nesting/roosting habitat within .7mi for spotted owl nest site MEN0233, and 10 acres of nesting/roosting habitat within .7mi for spotted owl nest site MEN0484. More information is available on the THP Tracking Center website. 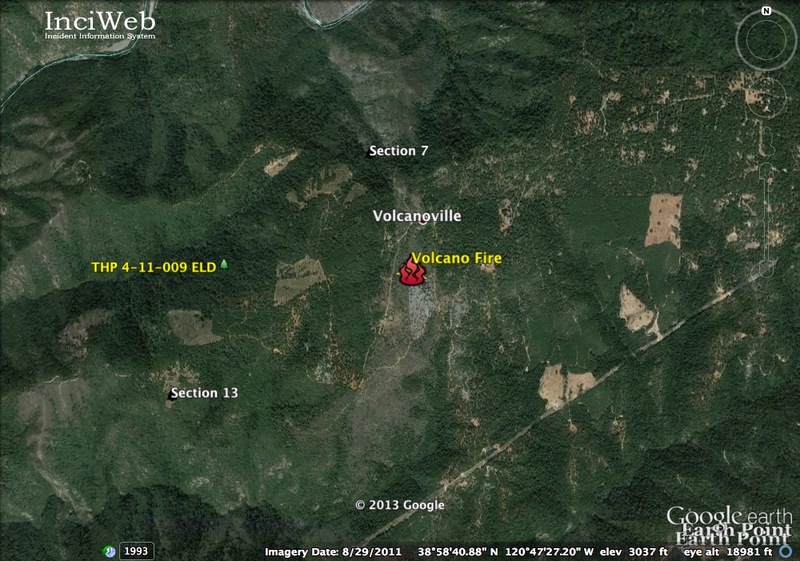 Green Diamond Resource Company to clearcut log near Pitcher Creek and Redwood National Park. THP 1-13-067 HUM (BL 2000 14 THP) Green Diamond Resource Company, 102 acres; 74% clearcut, 23% selection, 2% no-harvest, 1% roadside logging. Pitcher Creek (HUM: T9N R1E Sec.27, 34, 35). Winter operations, moderate erosion hazard, steep slopes over 60%, steep roads, landslide terrain, road failure sites, 18 road drainage work sites, oversized units, herbicides, coho watershed, 2 spotted owls within 1.3mi, northern red legged frog sighting in Unit B, fisher sighting near Unit B, trees up to 48” dbh. Estimated public comment deadline: 09/17/13. This THP is about 6.8 miles NE of the town of Trinidad, CA and a few miles SW of Redwood National Park. Green Diamond Resource Company is planning a mostly clearcut feller buncher, shovel and cable logging operation in second growth redwood, Douglas fir, Sitka spruce, grand fir and hemlock near Pitcher Creek and the middle to upper reaches of the North Fork of Maple Creek drainage. Green Diamond Resource Company owns over 98% of the North Fork Maple Creek watershed which contains coho, Chinook, steelhead and coastal cutthroat trout. They are planning to use shovel yarders in and around 2 adjacent close class III watercourses to yard logs in the southern portion of Unit B, and build a steep temporary road with a grade over 15% for 350 feet in Unit B. 18 road drainage work sites are planned including rocking, dip construction, culvert repair, ditch cleaning and road bed stabilization, and 1.2 miles of temporary road, 1230 feet of seasonal road construction and 1240 feet of road re-construction are planned. Units A & B are oversized, and there is deep seated landslide terrain in Unit B. A fisher was reported close to a main haul road near Unit B, and Northern Red Legged Frogs were seen near watercourses in Unit B. More information is available on the THP Tracking Center website. 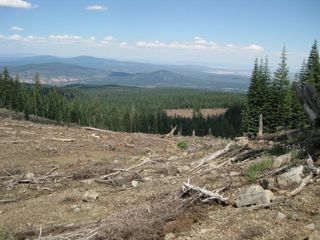 Green Diamond Resource Company planning clearcut THP north of Highway 299 Coast Range summit. 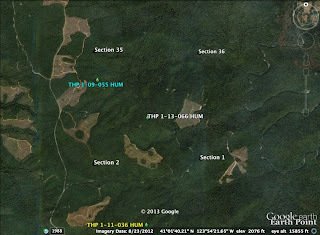 THP 1-13-066 HUM (K&K 840 14 THP) Green Diamond Resource Company, 104 acres; 79% clearcut, 18% selection, 3% no-harvest logging. Roaring Gulch (HUM: T7N R2E Sec.1, 2; T8N R2E Sec.35, 36). Wet weather operations, moderate erosion hazard, steep slopes up to 75%, steep roads, landslide terrain in Unit C, road failure sites, 6 road drainage work sites, herbicides, impaired 303.d watershed, coho watershed, 6 spotted owls within 1.3mi, trees up to 30" dbh. Estimated public comment deadline: 09/15/13. This THP is about 6 miles north of the Highway 299 summit on the coast range at an elevation of 1,300 to 2,160 feet. Green Diamond Resource Company is planning a mostly clearcut feller buncher, shovel and cable logging operation in second growth Douglas fir, redwood, and hemlock. The THP area drains into Redwood Creek which is listed as impaired for sediment and temperature, and is an important steelhead and coho fishery. There is a landslide area and 2 steep headwall swales in Unit C. 6 road drainage work sites are planned including dip construction, culvert repair and road bed stabilization. 4,465 feet of temporary road, and 2,145 feet of road re-construction are also planned. A Northern Spotted Owl was observed within .5 mi of Unit A. More information is available on the THP Tracking Center website. 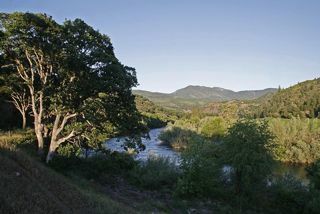 YREKA, Calif.— Three conservation groups filed a lawsuit today against the U.S. Fish and Wildlife Service and the National Marine Fisheries Service for approving a 50-year plan by Fruit Growers Supply Co. to accelerate logging of occupied spotted owl habitat and for granting “take permits” for endangered species on 150,000 acres of forest in Siskiyou County, Calif. The agencies approved a “habitat conservation plan” for Fruit Growers that continues a history of overharvesting, allowing the company to log thousands of acres in the next 10 years in exchange for promised future habitat improvements that are highly uncertain. Included in the plan is approval to “take,” that is, harm or kill, more than 80 northern spotted owls that are protected by the Endangered Species Act. Under the Endangered Species Act, habitat conservation plans allow corporations to harm or even kill endangered species, but only when the plan limits that harm as much as possible and includes concrete and certain measures that provide additional protections for listed species. 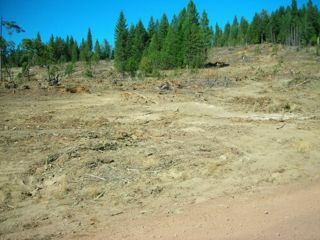 The logging plan for Fruit Growers instead encourages immediate forest liquidation in the first decade of implementation. Many of the promises for long-term habitat protections after the forests are logged, however, are either vague or non-binding, and in no way solve the problems the logging would create. Both the Environmental Protection Agency and the California Regional Water Quality Control Board have criticized the plan for allowing further degradation of water quality in an area already out of compliance with the Clean Water Act. The habitat conservation plan acknowledges impacts to Northern California Coast coho salmon, listed as threatened under the Endangered Species Act, as well as impacts to Upper Klamath chinook and Klamath Mountains Province steelhead. It also allows up to 83 northern spotted owls to be harmed or killed — nearly half the owls believed to live in the area. 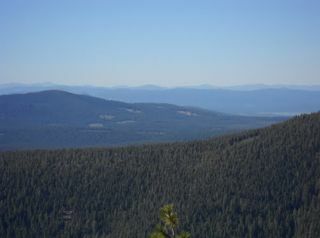 The land at risk is located between Weed, Calif., and the Oregon border, on both sides of Interstate 5, mostly in Siskiyou County, populated by Douglas fir, white fir and montane hardwoods. The Klamath and Scott River watersheds would be particularly hard hit by the logging. 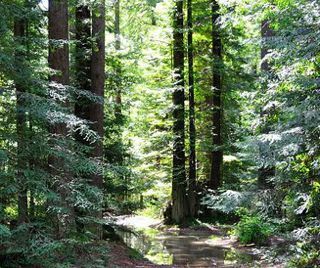 The conservation organizations are represented by the nonprofit Washington Forest Law Center and the Western Environmental Law Center. More information is available on the THP Tracking Center website. 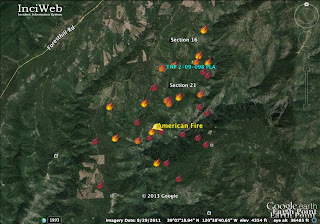 American Fire burning thru New Forestry LLC's Deadwood THP area. 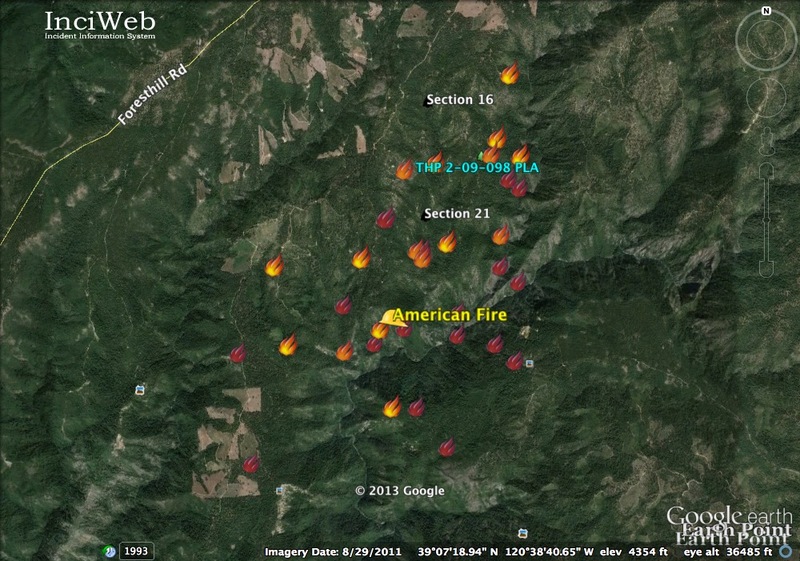 American Fire: The American Fire was first reported around 4:30pm on August 10th, 2013 near Deadwood Ridge, 17 miles NE of the community of Foresthill in Placer County. 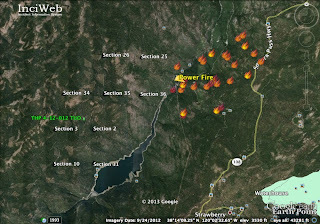 As of August 13th, 2013 the fire has grown to 1,750 acres in size, and is burning across the North Fork of the Middle Fork of the American River and thru New Forestry LLC's THP 2-09-098 PLA (Deadwood THP). The fire has been described as burning in heavy timber, and the cause has not been disclosed and is still under investigation. THP 2-09-098 PLA (Deadwood THP) New Forestry LLC, 153 acres, group selection logging. Secret Canyon, El Dorado Canyon, Screwauger Canyon (MD: T15N R12E Sec.12, 16, 21). Winter operations, moderate erosion hazard, scattered large trees, north fork american river roadless area, 4 CA spotted owl territories, sensitive plants. Estimated public comment deadline: 12/06/09. More information is available on the THP Tracking Center website. The California Fish and Game Commission (Commission) has moved to make the iconic Northern Spotted Owl a candidate for listing under the California Endangered Species Act (CESA). 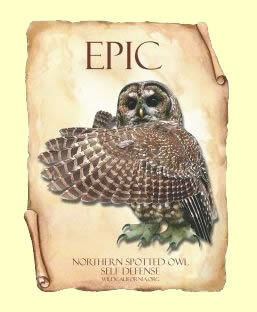 On August 7, 2013, the Commission voted 3-2 to advance the owl to candidacy status in response to a petition filed by the Environmental Protection Information Center (EPIC) requesting the listing of Northern Spotted Owls as “threatened” or “endangered” under CESA, finding that the petitioned action “may be warranted.” This is an important procedural step in the listing process for endangered species under California law. Mendocino Redwood Company planning new THP near Point Arena. THP 1-13-064 MEN (South Lee Crick THP) Mendocino Redwood Company, 304 acres; 39% rehab, 33% variable retention, 29% transition logging. Rolling Brook (MD: T12N R16W Sec.13, 24). Winter operations, moderate erosion hazard, landslide terrain, road failure sites, steep slopes over 65%, 13 road drainage work sites, herbicides, impaired 303.d watershed, coho watershed, 5 spotted owls within .7mi, trees up to 34” dbh. Estimated public comment deadline: 09/14/13. This THP is about 5 miles SE of Point Arena, CA at an elevation of 160 to 1,840 feet. Mendocino Redwood Company is planning a tractor logging operation in second growth redwood and Douglas fir. The THP area drains into the Garcia River which is listed as impaired for temperature and sediment, and is an important Coho and steelhead fishery. There is a 2005 landslide above a haul road, and several rockslide and transitional/rotational landslides in the THP area. 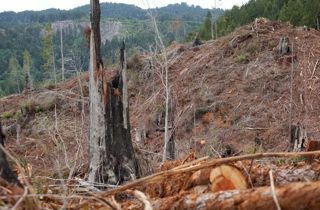 Mendocino Redwood Company wants to use tractors on small areas where skid trails have sidehill slopes exceeding 65%, and plans to do rehab logging on 118 acres to remove excess hardwoods. 13 road drainage work sites are planned including rocking, dip construction, culvert upgrading and road bed stabilization. More information is available on the THP Tracking Center website. 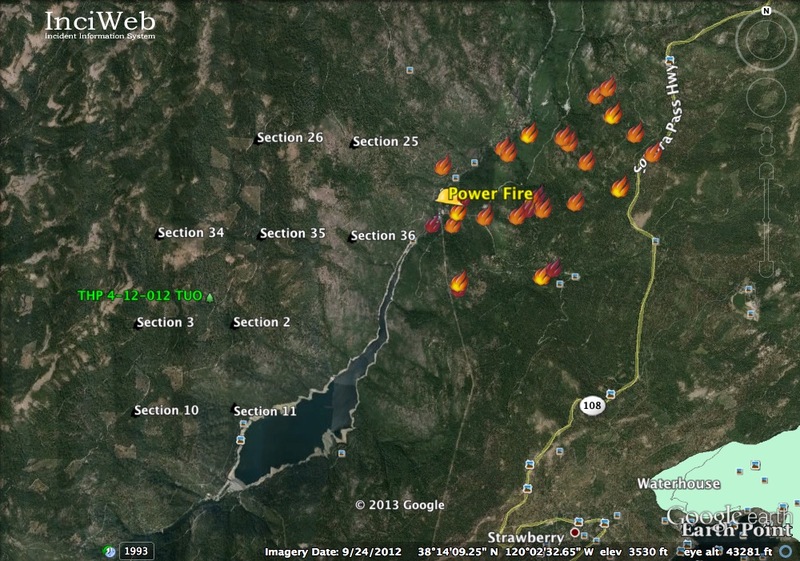 Power Fire: The Power Fire was first reported around 6am on August 5th, 2013 near Beardsley Reservoir and Highway 108 in Tuolumne County. As of August 6th, 2013 the fire has grown to 500 acres in size, and is 12% contained burning north and east of SPI's THP 4-12-012 TUO (China Hollow THP). The fire has been described as burning in brush and timber, and the cause has not been disclosed and is still under investigation. THP 4-12-012 TUO (China Hollow THP) Sierra Pacific Industries, 407 acres; 92% clearcut, 6% selection, 1% roadside logging. Brushy Hollow Creek (MD: T4N R17E Sec.2, 3, 10, 11; T5N R17E Sec.25, 26, 34, 35, 36). Winter operations, high erosion hazard, steep slopes up to 65%, 38 road drainage work sites, 9 CA spotted owls within 1.3mi, 2 goshawk nests within .25mi, bald eagle within 1.4 mi, trees up to 120 years old. Estimated public comment deadline: 06/01/12. More information is available on the THP Tracking Center website. Volcano Fire: The Volcano Fire was first reported around 3:15pm on August 3rd, 2013 about 3 to 4 miles south of the community of Foresthill. As of August 4th, 2013, the fire was at 11 acres in size, was 95% contained and was burning east of SPI's THP 4-11-009 ELD (And Um THP). The cause of the fire has not been disclosed and is still under investigation. 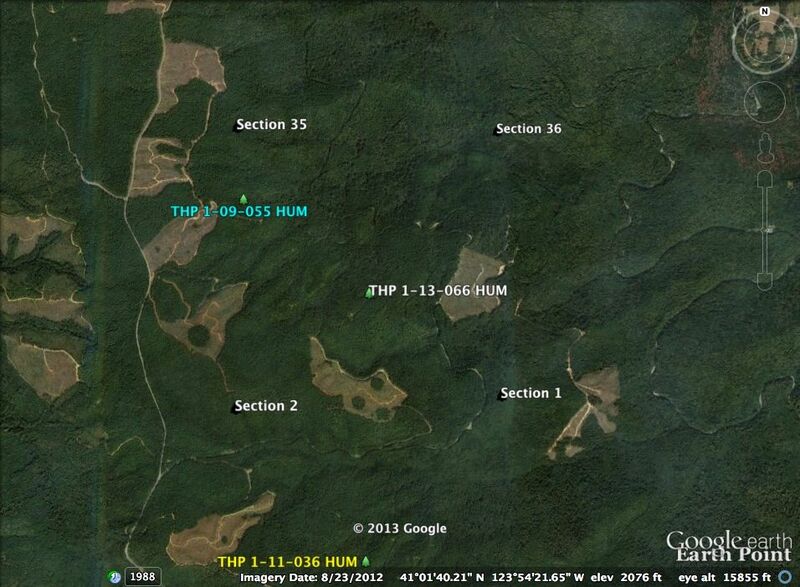 THP 4-11-009 ELD (And Um THP) Sierra Pacific Industries; 76 acres; 80% clearcut, 20% sanitation-salvage logging. Jesse Canyon, Otter Creek, Kanaka Gulch (MD: T13N, R10E, Sec 13, T13N R11E, Sec 7). Winter operations, moderate erosion hazard, steep slopes over 50%, 2 goshawk territories within 1.8 miles, 2 CA spotted owls within 1.6mi, nissenan manzanita, scattered large trees. Estimated public comment deadline: 06/25/11. 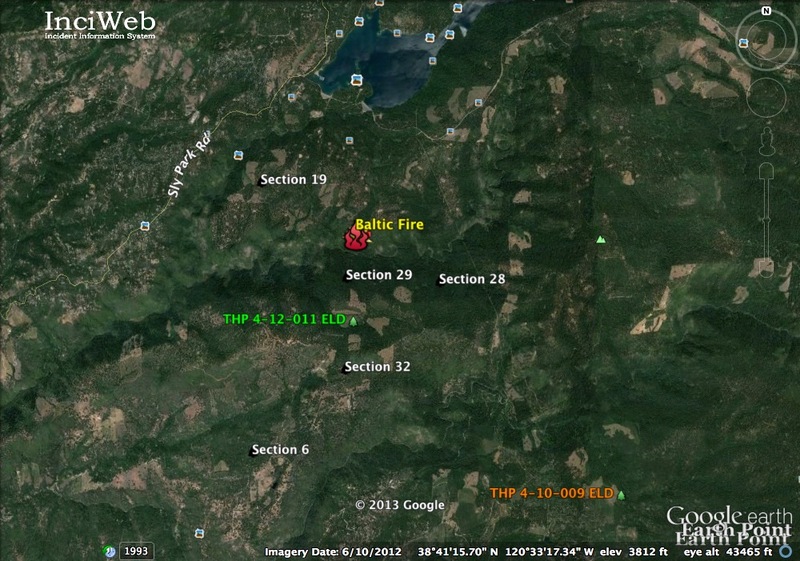 Baltic Fire: The Baltic Fire was first reported around 7:15 am on August 3rd, 2013 about 5 miles south of Pollock Pines. As of August 4th, 2013, the fire was 15 acres in size, was 80% contained and was burning just north and east of SPI's THP 4-12-011 ELD (Dude THP). The cause of the fire has not been disclosed and is still under investigation. 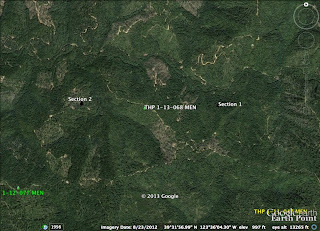 THP 4-12-011 ELD (Dude THP) Sierra Pacific Industries, 132 acres; 95% clearcut, 4% selection, 1% roadside logging. Lower Sly Park Creek, Middle Butte (MD: T9N R13E Sec.6; T10N R13E Sec.19, 28, 29, 32). Winter operations, moderate erosion hazard, slopes up to 50%, impaired 303.d watershed, 8 CA spotted owls within 1.6mi, golden eagle nest within 1.8mi, foothill yellow legged frog within .4mi, long legged myotis and fringed myotis sightings within 1mi, scattered large trees. Estimated public comment deadline: 05/28/12. More information is available on the THP Tracking Center website. Gualala Redwoods planning THP above the town of Gualala, CA. THP 1-13-061 MEN (Buttercup THP) Gualala Redwoods, 91 acres; 59% clearcut, 41% selection logging. Roseman Creek, Big Pepperwood Creek (MD: T11N R15W Sec.22, 27). Wet weather operations, high erosion hazard, steep slopes up to 70%, landslide terrain, 15 road drainage work sites, oversized unit 2, herbicides, impaired 303.d watershed, coho watershed, 2 spotted owls within 1.3mi, 3 osprey nests, thin lobed horkelia, long beard lichen, trees up to 150 years old. Estimated public comment deadline: 09/09/13. 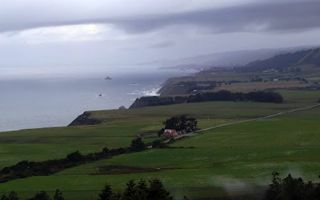 This THP is just above the town of Gualala, and has tributaries that drain into the Gualala River and the Pacific Ocean. Gualala Redwoods is planning a tractor and cable logging operation in second growth Douglas fir, redwood and tan oak at an elevation of 160 to 640 feet. 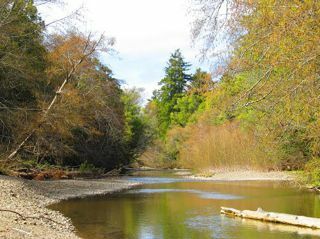 The Gualala River is an important steelhead and coho fishery and is listed as impaired for temperature and sediment. There are 15 road drainage work sites including dip construction, rocking, and culvert cleaning. Unit 2 is oversized at 23 acres, and there are 2 small older slides in Unit 4. Long Beard Lichen was found in a streamside area, and there are 4 sites of Thin Lobed Horkelia on a road bordering Unit 3. 3 osprey nests were located within the vicinity of Unit 4. More information is available on the THP Tracking Center website.